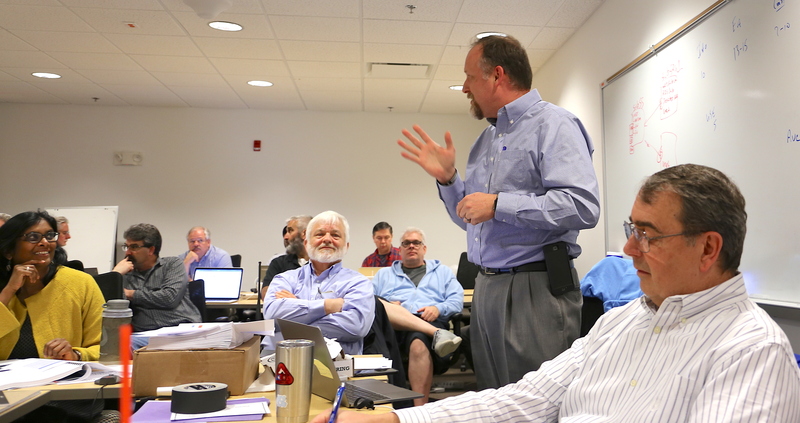 ITS Infrastructure & Operations completed its first tabletop exercise to test the efficacy of the ConnectCarolina Service Recovery Plan on February 22. This was the imaginary scenario: the ITS Manning data center suffered a failure and was inoperable for an extended time. A decision must be made whether a disaster should be declared, and whether to switch data operations over to the ConnectCarolina hardware running at ITS Franklin. More than 50 people participated, representing ITS, Procurement, Finance, Workforce Strategy Equity & Engagement, Payroll and Internal Audit. Matthew Mauzy, Emergency Response Technology Manager, led the training. This was the first major ITS tabletop exercise in 2019. ITS plans to hold a much larger one later this year. Mack and Mauzy have been working with the Disaster Recovery Committee on several mockup tabletops leading up to this one. There are more things to work on to prepare for the larger exercise, they said. That exercise will include a scenario that impacts multiple services. “We look forward to the next DR exercise in which we move closer to a real-world scenario with everyone responding and participating from wherever they are in the same manner they would in a true service outage,” Mauzy said. “Jim Gogan’s Netnado full-scale exercises set a high bar for disaster recovery and service continuity and have prepared ITS for the next phases of disaster recovery,” Mauzy added. Former Assistant Vice Chancellor of ITS Communication Technologies, Gogan retired in January after 42 years of serving UNC-Chapel Hill. Mauzy, Brenda Carpen, Brent Caison, Ethan Kromhout, Ray DeCristofaro and Don Hepp contributed significantly to the planning and coordination of the tabletop exercise.